Does Food Affect Your Sleep? The foods you choose to eat, how much you eat, and when, all can affect your sleep. Would you change your diet if you knew it would help you get a full night of uninterrupted sleep? Here is your chance to do just that. Read on to learn how your food choices may be influencing how rested you feel each morning. You’ve probably heard about the sleep-inducing powers of tryptophan, maybe in the context of a Thanksgiving meal. While it’s not exactly true that turkey makes you sleepy all by itself, it is true that turkey is a good source of tryptophan. But it’s hardly the only source of tryptophan. You can also find it in chicken, ground beef, milk, nuts and seeds, honey, and even bananas. Tryptophan is an essential amino acid. Your body can’t produce it by itself, so it needs to find it in the food you eat. Tryptophan can be made into serotonin, which can in turn be made into the melatonin hormone. Melatonin regulates your sleep-wake cycle. Your body produces it mostly between the hours of 3 a.m. and 4 a.m. Most importantly for this article, melatonin triggers sleepiness. But to get your tryptophan in a way that your body can use it to produce melatonin, your body needs some extra help. If you’re searching for sleep, tryptophan has an ally that needs special attention. Carbs (carbohydrates) eaten with tryptophan can bring on sleep-inducing serotonin more reliably. When you eat a protein source containing tryptophan, the amino acids from the protein must compete to get through your body’s blood-brain barrier. That makes it less likely the tryptophan you eat will be converted into serotonin. However, eating carbs triggers insulin. That insulin lowers the amino acids in your blood—except tryptophan. In other words, carbs clear the way for tryptophan to enter the brain. While carbs with protein help make you sleepy, it’s important for your overall health to choose healthy carbs. 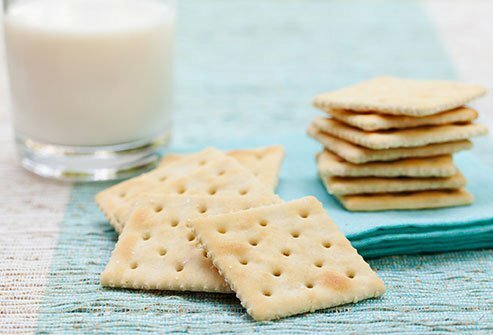 Whole-grain crackers and fresh fruit are examples of such carbs, so a healthy bedtime snack might look like a serving of milk and crackers, or a few lean bites of chicken with an orange or banana. Should You Snack Before Bedtime? Is it a good idea to go to bed hungry? Even if a little calming food sounds relaxing, you may fear gaining weight from midnight snacking. This is a tricky situation you will want to handle carefully. 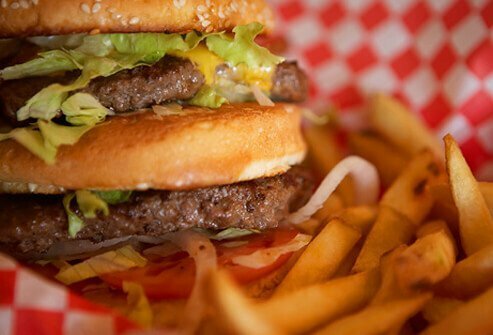 If you find yourself binging on high-calorie foods late at night, this can indeed promote unhealthy weight gain. It can also make it tougher to sleep, especially if you experience heartburn. However, insomnia can be worse on an empty stomach. Going to bed without eating can make it harder to fall asleep, and also leaves you prone to waking up in the middle of the night more frequently from hunger. Also, if weight is a concern for you, studies show that inadequate sleep stimulates the hunger hormone ghrelin. So if you can’t sleep well on an empty stomach, you may make up for it the next day by eating too much. The solution is to go to bed with some food in your stomach, but not too much. Try a light snack instead of an all-out food fest. If your light snack isn’t satisfying, see if a high-fiber light snack helps. Fiber slows down your digestion, leaving you feeling full longer with fewer calories. This tip doesn’t rely on when you eat. If your overall diet relies on fat—especially saturated fat—for nutrition, you may be depriving yourself of good, quality sleep. When your daily nutrition includes a high percentage of saturated fat, you spend less time in the stage of deep sleep known as slow wave sleep. This is the non-REM sleep you get earlier in your sleep cycle, and it matters. Your brain re-enforces things you learn during the day while you sleep. Studies have shown that missing out on slow wave sleep makes you remember less, which makes learning more difficult. You probably know drinking a pot of coffee before bed is a bad idea if you want to actually sleep. But caffeine lies waiting in other foods you may not suspect. 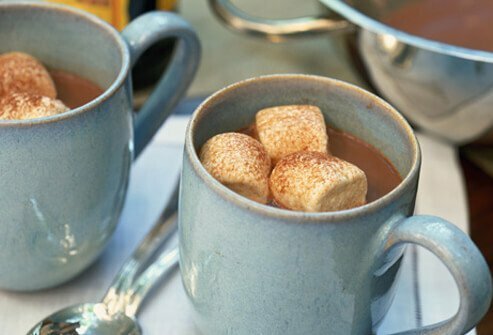 A cup of hot cocoa before bed sounds soothing, but cocoa is made from chocolate, and chocolate has caffeine. Caffeine hides in many beverages you may not guess, like some brands of root beer. So check the label to make sure you aren’t accidentally stimulating your brain when you’d rather be calming it. If you have a headache before bed, you might not think twice before popping an Excedrin. But one of this popular headache remedy’s main ingredients is caffeine. It’s not the only medication with caffeine. 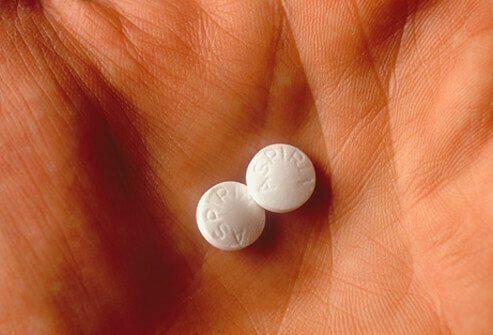 Many other pain and headache drugs contain this stimulant as well. So do some cold medicines, weight loss pills, and diuretics. Some herbal remedies are caffeinated too. Caffeine lasts a long time in your body, too, so a caffeinated medication taken in the afternoon could still interfere with sleep. The best way to prevent accidental caffeine is to read the label of each medication carefully. Alcohol’s relationship to sleep is extremely complicated. Although it’s been studied since the 1930s, scientists are still searching for answers about the relationship alcohol has with your sleep quality. All of those studies have taught us a few things, though. First, alcohol makes it easier to fall asleep quickly. That’s true whether you have one drink or several. Second, alcohol disrupts your second half of sleep. Wondering why? One theory suggests your body adapts to the sedative effects of alcohol during the first half of your sleep cycle, and continues to attempt to adapt during the second half even though it has processed the alcohol out of your bloodstream. Third, when you drink a moderate to high amount of alcohol, your REM sleep stage shortens (your dreaming stage), while your slow wave sleep increases. Fourth, your body becomes more resistant to the sleep-inducing effects of alcohol after just three nights of drinking. There are hints of other effects, too, that are less well-established. If you drink heavily, you may be more likely to snore, and that can harm your sleep quality. You may also wake up more frequently and earlier after a night of heavy drinking. You may be less rested the next day, and this may slightly impair your concentration. (Even a slight impairment can cause problems in a demanding job like air traffic control). It’s possible that insomniacs sleep better with one to two drinks before bed, but the same amount may be more disruptive for healthy adults. Seniors should be particularly cautious around alcohol at bedtime, because they require less alcohol to feel the same effects, and because they may wake up still under the effect of alcohol, which increases their risk of falling. Do Spicy Foods Give You Bizarre Dreams? Eating spicy food right before bed can sabotage your sleep. That’s because spicy foods can bring on heartburn, and heartburn pain can rouse you from your peaceful slumber. In one study, six young men were given Tabasco hot sauce and mustard with their dinners. It took them longer to fall asleep, and they experienced less slow wave sleep too. One question, however, persists—is the old belief that spicy foods cause bizarre dreams true? This idea goes back at least as far as the ancient Greeks. Famous physician Hippocrates claimed that nightmares could be provoked by “a surfeit of unaccustomed food.” Is there any truth to this? Although it’s a popular idea that pops up again and again throughout history, scientists haven’t shown much interest in exploring whether or not it’s true. There was one attempt, however. Researchers asked hundreds of college students if the foods they ate provoked disturbing dreams. They found that about 18% of the students did report vivid or disturbing dreams after eating a particular food. Of those, about 20% said the food causing these dreams was spicy. Maybe Hippocrates was right. You may not need to cut all of these out of your dinner plans, as some may trigger your acid reflux worse than others. 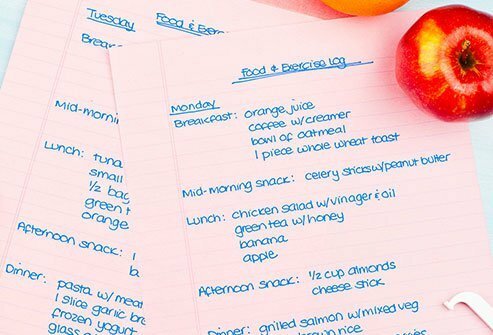 To find the foods causing your pain, keep a journal and write down what you ate every time you experience heartburn. 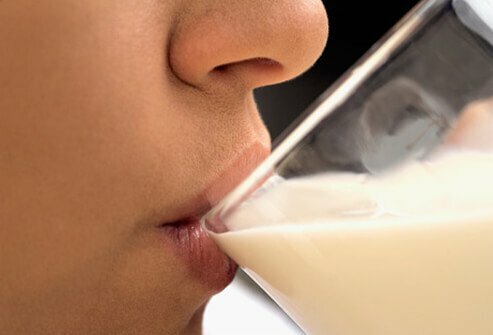 Protein seems to help you fall asleep faster, but it may depend on what comes with it. Researchers studied how long it took their subjects to fall asleep, first giving them their food for the day, and then letting the subjects choose their own meals. The meals the scientists fed them were higher in protein, but lower in saturated fats than the self-selected meals. The results? People who ate the high-protein, low-saturated-fat meals throughout the day fell asleep 12 minutes faster on average. The trick is to get plenty of protein from your diet, but to avoid saturated fats. 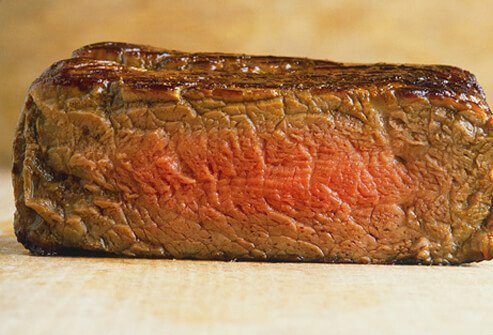 Some protein sources high in saturated fat include lamb, fatty cuts of beef and pork, skin-on poultry, cheese, and whole milk. On the other hand, fish, skinless poultry, lean cuts of beef, skim milk, and azuki beans are a few high-protein foods that have little or no saturated fat. You’re all settled in. The house is quiet, the bed cozy, you’ve eaten healthy, nutritious foods, but not too much. You’re just about to drift into a deep, restorative slumber, but then nature calls. If you hadn’t had that big glass of water right before bed, you wouldn’t have to get up right now. But what if you’re thirsty? If you find yourself waking up in the middle of the night to relieve yourself frequently, it’s time to start planning ahead. Make sure you’re well-hydrated well before you turn the lights out. Two hours before bedtime, start limiting your liquids. Get enough water before that time, and limit your alcohol to one drink or less during that window. Of course you will want to abstain from any beverage with caffeine too. Here’s another trick: lift your legs up. If you recline with your legs at heart-level for an hour in the late afternoon, you are more likely to urinate during the day than at night. Smokers are sometimes lured to the patio just before bed for one more drag. The nicotine may feel soothing in the moment, but don’t forget—it’s a stimulant. It makes your heart beat faster, and will make falling asleep more difficult for you. 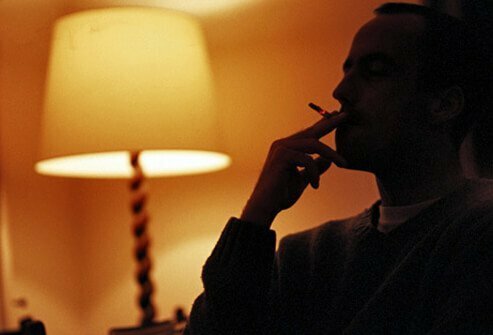 Nicotine—the addictive ingredient in cigarettes—has been shown to mess with the biological clock found in the genes of mice. In one study it disturbed the rodents’ natural sleep rhythms, making it harder for them to get to sleep. Some of those disturbances are permanent. Is it doing the same to you? Another concern is sleep apnea, a condition in which you are periodically deprived of oxygen throughout the night. Smokers are 2.5 times more likely to have it. This may be a minor concern compared to a shorter life span, greater risk of various cancers, premature aging and various other health problems associated with smoking, but it’s one to consider if you’re trying to sleep more peacefully. Sweet slumber is just another great reason to quit smoking. We’ve mostly focused on foods you eat right before bed. But that doesn’t tell the whole story. Studies show that the nutritional quality of your food throughout the day makes a difference at night. The more calories you get from sugar and saturated fat, the more likely you are to experience sleep disturbances. On the other hand, diets high in fiber and protein seem to help you fall asleep and stay asleep throughout the night. Sleeping pills are a tempting solution for sleeping problems. More than 9 million Americans use prescription sleep aids, and that number is rising. Used correctly, sleeping pills can help you develop a more regular sleep pattern and help you sleep better. But if they aren’t used carefully, sleeping pills can cause more problems. If you want to try sleeping pills, first discuss it with your doctor. Your doctor can steer you toward a helpful medication based on your sleep symptoms, medical history, and age. You want to approach these drugs with caution: many of them are addictive. This is why most people use them only for a short time.